*This blog post contains affiliate links for your convenience. These are some of my absolute favorite homekeeping products! If you have been following this blog for a while, you may remember my previous post about our laundry room/pantry organizing project (seen here). After my beloved washing machine broke yet again, we decided it was time to bite the bullet and upgrade our washer and dryer to new, more efficient models. As much as I loved our old top-loader, I did feel a bit guilty with a non-HE washing machine here in this awful California drought. Once the new washer and dryer came in, my old organizing shelf had to go. That prompted a few reorganizing plans. I am so happy now with our ultra-organized space! It is a tiny little multi-purpose room, but it works so well now!One of the first things I updated was our pet food storage, seen in the bottom left corner of the photo below. I ordered one container for cat food, and one for dog food (and labeled each). It works great, especially since they are on wheels and can hold everything from the big huge bags of pet food. My husband built me this awesome organizing cupboard in the extra space for all of my cleaning/laundry supplies, and our recycle bin and garbage bin. Having those two things behind doors is great with a toddler and dogs. Next to the new cupboard (which he made out of leftover fence boards! ), I have my brooms, mop, duster, and rug beater all hanging on this organizer. I also dedicated a spot on the side of the cabinet for the things my husband always seems to be looking for: a clipboard and the lint brushes. Now that they have their own designated spots, that seems to help cut down on a lot of searching and confusion! I got the clipboard and the small white bins on the top shelf at the dollar spot at Target! Every time I go to Target, I always cruise through there to check for any cool organizing supplies, or little wooden toys that would be great for toddler busy bags. It is my favorite part about going to Target. 🙂 Above the cupboard is one of my favorite cleaning devices, my LittleGreen carpet and upholstery cleaner (so easy to use and works really well!). I labeled all of my small bins with my LetraTag and these labels. I may go overboard labeling everything at times, but it makes such a difference in keeping things organized! On the next shelf, I have my favorite cleaning basics in clear jars, my favorite stain treatment, Nellie’s All-Natural Oxygen Brightener, and a basket for my wool dryer balls. Below that, I have a jar of dog treats, anti-bacterial wipes, and a basket of some of our favorite teas (my husband is more likely to grab a bag of tea instead of a soda if he sees the tea out on display and looking pretty). Inside the cabinet, there is a shelf above the trash/recycling cans where I store more cleaning supplies and refills, including my microfiber cloths for my Swiffer mop! I found the two cute WASH containers on clearance at TJ Maxx, and the turquoise bin was from the dollar spot at Target! In the binder, I keep all of my housekeeping and gardening checklists, and a collection of magazine articles with fun family ideas in Southern California, for great weekend day trips. Next to the new cupboard, I ordered an over the door shoe organizer to organize all of my cleaning products (a great Pinterest-inspired idea that I’ve been meaning to do for a while!). I also ordered some fresh cleaning cloths since our old ones were starting to fall apart. Amazon Prime is so amazing…you can find just about anything on there for a great price! On the inside of the other door, I got a multi-hook over the door hanger on clearance at Ross, that works great for hanging my herbs to dry, and I also use this spot to hang our calendar. Originally, my husband planned to install doors over the pantry cupboards. Then we got busy with more urgent projects, and I realized that as we added a few more things in here, it would be a bit too crowded with doors. 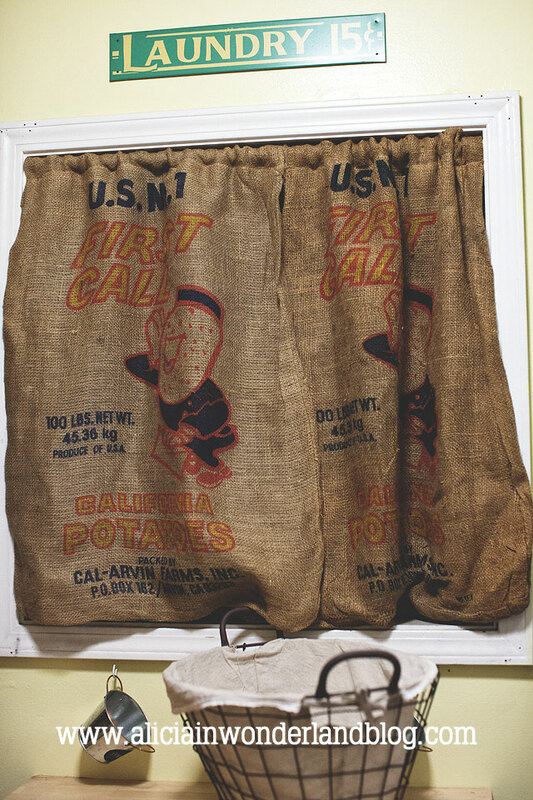 So I just covered up the ugly central heating unit with a burlap curtain. Next to that, I have our ironing board (nice because it is extra wide), and hanging organizer. I made two spray bottles that I spruced up with this contact paper, one for plain water, and one with a vinegar/water mixture (a great, natural wrinkle remover). I have one bottle from Home Depot and one from Lowe’s. The one from Home Depot wins, hands down. The one from Lowe’s barely works already. On the other side of the heater cabinet, I have my vintage washboards hung for easy access if needed for spot cleaning (and just decor too). On the side of the dryer, I used some magnetic clips to hang up some of my frequently used cleaning/gardening lists and stain treatment chart. I got the magnetic clips at the dollar spot at Target (pretty sure they still have some of these available). The strange looking magnet is a recycled magnet from a hard drive that my husband had since the dollar spot magnets were not strong enough to hold up multiple laminated sheets (I laminate all of my checklists that I use often using this laminator and these sheets). Below our Ikea fold-down table (which is never really folded down), I have our triple sorting laundry hamper. I have chalkboard signs on there for hand-wash, lights and darks (another Target dollar spot find!). Next to that (on the left) is our rolling laundry basket. This is one of my favorite things because it helps me roll the clean laundry out of the laundry room when I want to fold it all elsewhere (usually in the living room so I can watch TV while I fold). Great for days when my back hurts, or when I have had medical restrictions about lifting anything heavy. Originally, I had purchased a similar laundry basket elsewhere, and it broke within the first couple of days. This one has been amazing, and is really heavy duty. Previously, I had our lone socks hanging on a piece of twine, but I upgraded them to this cute little display with an antique washboard. One important thing to note…hot glue did not keep the clothespins on the washboard, but super glue did the trick. Still love our pull-out pantry drawers! My husband is notoriously bad about remembering to bring reusable bags with him to the grocery story when he makes a quick run. Even if I had him some before he leaves, somehow he still forgets them, so we end up saving a lot of paper bags. 🙂 Thankfully, I always end up needing them in the compost bin or for kindling, etc. I gather them all up and store them in this “wasted” space, in front of the electrical panel (such an annoying location for that panel). I also keep our vacuum and attachments stored here. I have a piece of twine nailed to the wall that I use as a tiny indoor clothesline. Perfect for air-drying cloth diaper shells! Below that, between the Ikea table and the washer/dryer, I have our clothes drying rack. I have gone through many poorly made clothes drying racks in my life, and this one is so well made and holds so much! Below the window, I hung these three little metal buckets for tossing in miscellaneous odds and ends that turn up with the laundry, such as coins, lint (I save lint for the compost bins), etc. I actually got this great idea from ABowlFullofLemons.net! I made homemade chalkboard labels for those buckets (instructions here). I originally hung those buckets up with 3M damage free hooks, but I soon realized that those hooks work fine in our entry room with the eggshell finish paint, but they do not work at all in our kitchen or laundry room, where we have semi-gloss paint on the walls. So I replaced those hooks in the laundry room with some standard, screw-in hooks.